Read Mind on Movies review of SHOT. A gripping drama about three lives irrevocably changed when a gun is accidentally fired on a busy Los Angeles street. 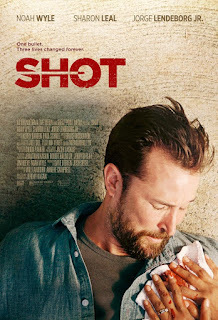 “Shot” is the story of Mark Newman (Played by Noah Wyle), a struggling husband. One day as him and his wife Phoebe (Played by Sharon Leal) are arguing, down the street and a bullet flies out of nowhere. This bullet impacts Mark, putting him in a life or death situation. But on the other side of the glock, there is Miguel (Played by Jorge Lendeborg Jr.), a seventeen year old who accidentally performed a shoot and run, under the influence of his older cousin. Will Mark be able to survive such a fatal impact? And if so what will happen to Miguel? This film is directed by Jeremy Kagan, an older director who previously directed “The Journey of Natty Gann” (1985) and “Roswell” (1994). And this movie has good ideas running throughout. But it struggles quite a bit. This film jumps right into the plot, but once it gets there it begins to bore the audience. About forty five minutes of the film consist of Mark just lying in the hospital struggling. While that is emotional, it does not carry a movie. 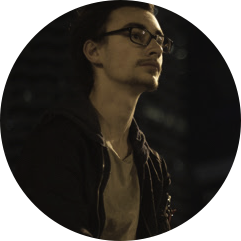 The film tries to get deep, talking about subjects such as racism, and unhealthy marriages. But just scrapes the surface. It also brought up many ideas, but never expanded upon them later in the film. Although, The film did have a pretty jarring ending and I do have to give Kagan condolences for that. Acting wise, I really liked Noah Wyle’s (Previously seen in “Falling Skys” and “Donnie Darko”) portrait of Mark. He just seemed like a cool dude and when he was struggling in the ER it was very believable. But countering him Lendeborg Jr. (Previously seen in “Spider-Man: Homecoming” and “Brigsby Bear”) did not give the best performance. I found him very dry, and I am not sure if he had bad direction or what, because I thought he was great in “Brigsby Bear”, earlier this year. Now “Shot” made some weird artistic choices in the way the film was shot and edited. It contained quite a bit of POV (Point of view) shots, and a solid amount of split screen editing, showing both Mark and Miguel's points of views. And while I believe this was supposed to make the audience feel nauseous as Mark was feeling, it just felt unnecessarily sloppy. 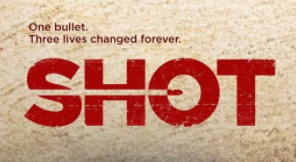 Overall, “Shot” is not a horrible film...but it is also definitely not a great film. I think that the acting and boringness of the film really does not make it a film that audiences need to rush to see. The ending is quite a bit of a shocker and it does have a positive message about gun safety. But I honestly think it is not worth watching, unless you see it on cable.